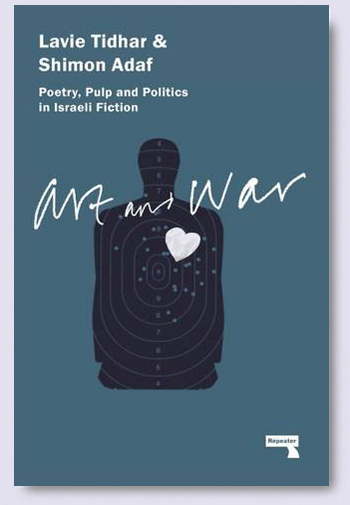 Art and War: Poetry, Pulp and Politics in Israeli Fiction, my debut non-fiction book, with my friend Shimon Adaf, is now available for pre-order (Amazon; Amazon UK). It is published in March 2016 by Repeater Books. Here is the cover, and description! Shimon Adaf and Lavie Tidhar are two of Israel’s most subversive and politically outspoken writers. Growing up on opposite sides of the Israeli spectrum — Tidhar in the north of Israel in the Zionist, socialist Kibbutz; Adaf from a family of religious Mizrahi Jews living in Sderot — the two nevertheless shared a love of books, and were especially drawn to the strange visions and outrageous sensibilities of the science fiction that was available in Hebrew. Here, they engage in a dialogue that covers their approach to writing the fantastic, as they question how to write about Israel and Palestine, about Judaism, about the Holocaust, about childhoods and their end. Extending the conversation even into their fiction, the book contains two brand new short stories — “Tutim” by Tidhar, and “third_attribute” by Adaf — in which each appears as a character in the other’s tale; simultaneously political and fantastical, they burn with an angry, despairing intensity.